Orange Mycena (Mycena leaiana), growing from a dead hardwood. 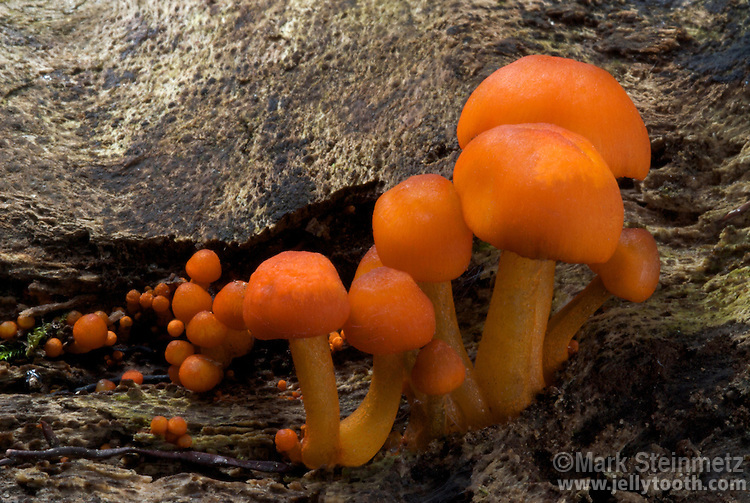 This striking and colorful mushroom is widespread and fairly common, epecially in Eastern US forests. Note in this cluster, development of a few of the individual mushrooms was inhibited by the tough black mycelial cords, called rhizomorphs, of Armillaria mellea, attacking the same tree. Monongahela National Forest, West Virginia, USA.